Dr. Steve A. Brown, National Advisor & Board Chair, National FFA Organization (FFA) is celebrating over 90 years in making a positive difference in the lives of students by developing their potential for premier leadership, personal growth and career success through agricultural education. Under his leadership, FFA has experienced a record high national membership of 669,989 from 8,630 chapters. Brown is a product school-based agricultural education and FFA. He became the National Advisor in 2011 with more than 35 years of service to FFA and school-based agricultural education. He served as the National FFA Executive Secretary from 2008 to 2010. Brown began his professional career as an agricultural education instructor and FFA Advisor at the Area Career and Technical Center in Macon, Missouri. He served as a district supervisor in agricultural education and state FFA executive secretary at the Missouri Department of Elementary & Secondary Education for 23 years. Brown received his doctoral degree in agricultural education at the University of Missouri-Columbia. 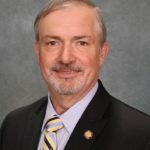 Some of his previously served professional roles include president of the National Association of Supervisors of Agricultural Education and Director on the National Council for Agricultural Education. He serves as an Educational Program Specialist in the College and Career Transition Branch (CCTB), in the Division of Academic & Technical Education (DATE) of the Office of Career, Technical and Adult Education (OCTAE) at the U.S. Department of Education (ED). Responsibilities include providing technical assistance, professional leadership and expertise in developing, improving, planning and evaluating Career and Technical Education programs.